Conor McBride's discovery that you can differentiate container types to get useful constructions like zippers has to be one of the most amazing things I've seen in computer science. But seeing the success of differentiation suggests the idea of taking a step back and looking at finite differences. Δ is the finite difference operator. But does it make any kind of sense for types? At first it seems not because we can't define subtraction and division of types. Can we massage this definition into a form that uses only addition and multiplication? First consider Δc where c is a constant function. Then Δc(x,y)=0. Now consider the identity function i(x)=x. Then Δi(x,y)=1. Δ is linear in the sense that if f and g are functions, Δ(f+g) = Δf+Δg. Now consider the product of two functions, f and g.
That tells us that Δf(x,y) = f(x)f(y). So we know that on types, ΔF(X,Y) = XN-1+XN-2Y+...+YN-1. With a little rearrangement this becomes the definition of finite difference. Now that we've recognised dissection as finite difference we can reason informally about dissection using high school algebra. For example, we already know that lists, defined by L(X) = 1+X L(X) can be informally thought of as L(X)=1/(1-X). So using the example I gave above we see that ΔL(X,Y)=1/((1-X)(1-Y)) = L(X)L(Y). So the dissection of a list is a pair of lists, one for the left elements, and one for the right elements. Just what we'd expect. In other words, a dissection of a tree is a list of trees, each of which is a tree of X or a tree of Y. 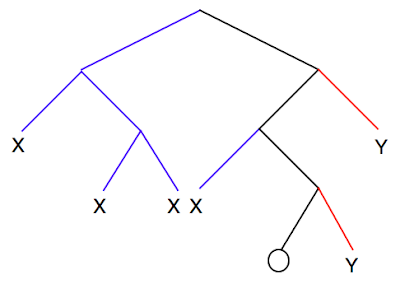 This corresponds to the fact that if you dissect a tree at some element, and then follow the path from the root to the hole left behind, then all of the left branches (in blue) are trees of type X and all of the right branches (in red) are trees of type Y. If you're geometrically inclined then you can think of types with holes in them as being a kind of tangent to the space of types. Along those lines, dissections become secants. I think this geometric analogy can be taken a lot further and that in fact a non-trivial piece of differential geometry can be made to work with types. But that's for another day. Oh, I almost forgot. Derivatives are what you get when you compute finite differences for points really close to each other. So I hope you can see that Δf(x,x)=df/dx giving us holes in terms of dissections. Conor mentions this in his paper. We should also be able to use this approach to compute finite differences in other algebraic structures that don't have subtraction or division. 1. What does finite differencing mean when applied to both ordinary and exponential generating functions? 2. Can you derive the "chain rule" for finite differences? This can be useful when you compute dissections of types defined by sets of mutually recursive definitions. 1. Refactoring the technique in my previous post so that building the search tree is entirely separate from searching the tree. 3. Applying it to an ambiguous parsing problem, making use of a type class to define an abstract grammar. The idea is that I want to search a tree of possibilities where each edge of the tree is marked with a weight. The goal will be to search for leaves that minimise the sum of the weights of the edges down to the leaf. The minimum weight leaf is at C. If we're working with probabilities then we'll use minus the log of the probability of a branch as the weight. That way multiplication of probabilities becomes additions of weights, and the likeliest leaf has the minimum weight path. The only tricky aspect to this code is that we need to be able to handle infinite trees. We can't have our code simply go off and return when it's found the next match because it might not be possible to do so in a finite time. Instead, the code needs to perform one operation at a time and report what it found at each point, even if that report is just stalling for time. We do this by returning a (possibly infinite) list containing elements that are either (1) the next item found or (2) a new update giving more information about the lower bound of the cost of any item that might be yet to come. This allows the caller to bail out of the search once the cost has passed a certain threshold. 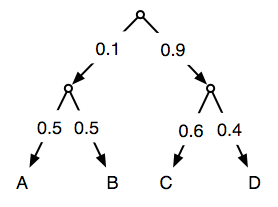 I guess this is actually Dijkstra's algorithm, but on a tree rather than a general graph. I'm going to assume that sentences in my language are described by a "context free" probability distribution so that a noun phrase, say, has a fixed probability of being made up of each possible combination of constituents regardless of the context in which it appears. I need an English word for something that takes a grammar and does something with it but I'm at a loss to think of an example. I'll use 'transducer', even though I don't think that's right. > string ""     = return ""
We're going to use this grammar with two instances of type Transducer. The first will use the rules of the grammar as production rules to generate random sentences. The second will parse strings using the grammar. So we get two uses from one 'transducer'. This is pretty powerful: we have described the grammar in an abstract way that doesn't asuume any particular use for it. > test4 = countResults 100000 (noun :: Parser Noun) "abab"
>    let string = "ababbbab"
You should see the parsings from countResults in roughly the same proportion as the relative probabilities given by findParse. Remember that the relative probability of a given parsing is the last Left p term before that parsing. Try playing with string, the number of Monte Carlo runs and the seed. Remember that there is going to be some variation in the randomised algorithm, especially with hard to parse strings, but raising the number of runs will eventually give reasonable numbers. Of course ultimately we don't care about the Monte Carlo method so it's allowed to be slow. Anyway, none of this is a new algorithm. You can find similar things in papers such as Probabilistic tree transducers and A Generalization of Dijkstra's Algorithm. But what is cool is how easily Haskell allows us to decouple the tree building part from the searching part. (And of course the tree is never fully built, it's built and destroyed lazily as needed.) All of the published algorithms have the parsing and searching hopelessly interleaved so it's hard to see what exactly is going on. Here the search algorithm doesn't need to know anything about grammars, or even that it is searching for parsings. Semiring Parsing is also easy to implement this way.